We (this includes you, dear reader! ), are currently selling the top-ranked private label product on Amazon! 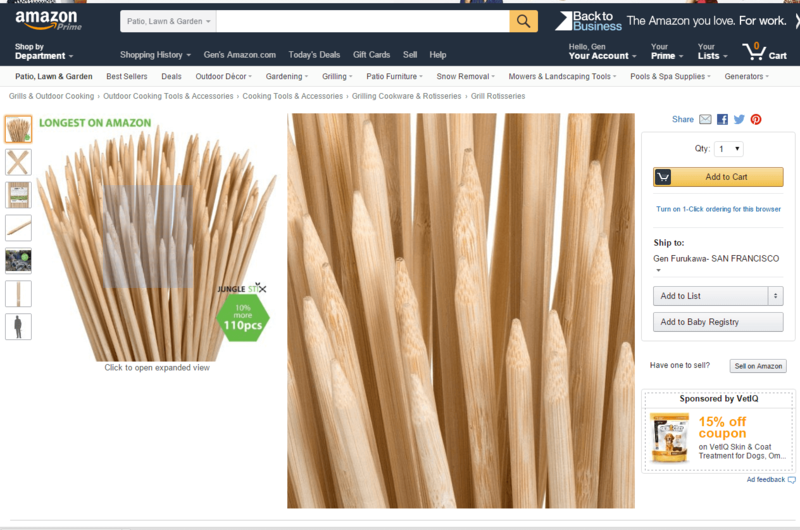 As of this writing, if you type in “marshmallow sticks” or “bamboo marshmallow sticks”, guess what product you will see as the first result? Yup, some 36” extra long heavy duty wooden skewers perfect for marshmallow s’mores! So that is pretty cool to see, huh? There is some fluctuation, so we unfortunately are not cemented to the top position….but we did it! So what is the value of the top position? I have not seen any in-depth data about Click Through Rate (CTR) as it relates to position in Amazon’s organic results, but I have seen some interesting data relating to CTR in Google’s organic rankings. Study by Advanced Web Ranking. Unsurprisingly, based on this study, the top result generated the lion’s share of clicks with 31% CTR, more than twice that of the second position. Sure, this is based on behavior on Google and not Amazon, but I still think that it’s applicable. Part of the important criteria in choosing your private label product is that shoppers will be brand-agnostic, meaning that they won’t purchase Jungle Stix over Mallo Me or another similar product, simply based on the brand name. The organic search results, and whatever is the first result, heavily influences the purchase behavior. So that top spot is so highly coveted, and we have won it! In this post, I will outline the key factors that helped us get to the top spot. And it took exactly 53 days to reach that goal, which I think is noteworthy, but fully replicable for you and your private label product. Just a quick recap, we are currently selling on average 16-20 units per day, priced at $19.99. 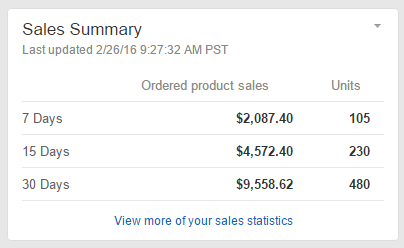 For the past month, this translates $9,558 in sales from 480 units in the past month. Mind you, this IS NOT profit, just top line revenue. Do you know my favorite dance to bust out at a wedding? The two-step! Why? Because it is so simple and straightforward (I do have my own twist to it though….). I also see that launching a private label product on Amazon is simply a two-stepper: get reviews, and get sales. Also simple and straightforward. For my promotional push, I put Jungle Stix on Review Kick*, and have received most of my reviews from there. We currently have 70 reviews for Jungle Stix, and overall a five star rating. A quick note on Review Kick*, in case you are wondering: getting reviews from Review Kick is fully within Amazon’s Terms of Service, as they are honest reviews in exchange for discounted products. It is imperative that reviewers leave that disclaimer in the reviews, and as long as that happens (which is required as a policy by Review Kick), everything is kosher. Due to changes in Amazon’s Terms of Service addressing incentivized reviews, this method of utilizing promotions to incentivize reviews is no longer allowed. Review Kick has now been relaunched as Jump Send, focusing on email communications to help Amazon sellers grow their business. You can still legitimately run promotions, which is a great way to increase sales velocity, but we do not allow any form of incentivized review to ensure this is within Amazon’s TOS. This is still one of the best launch tactics and we still advise running a promotion when launching a new product. Find out more about how Jump Send can help you boost you Amazon business in our relaunch blog post. I covered the unit economics of my giveaways here, but to recap quickly, I am spending about $12 for each product that I giveaway. I arrived at this figure by calculating the $7 in Amazon Fees based off $19.99 retail price, plus the $7.02 cost per unit (price per unit of my first shipment, my second shipment I was able to get that down to around $5), minus the $1.99 that we “sold” it for on Review Kick. So paying $12 per each promotional product, I definitely want to make sure that I get a good ROI, measured by an actual review for each product that I give away. There are some interesting figures to see here: there have been 70 products given away on Review Kick (you can see that I have approved 70 reviewers), and of those, 68 have left reviews. At $12 per giveaway, I am quite happy with a 97% giveawaway-to-review ratio! And clearly they are solid five star reviews, more on that in a minute. The 70 reviews that we currently have is instrumental in our top spot. Social proof, ie reviews, are so important to the success of your private label product. It improves conversion rates of customers who want verification that their purchase will be worthwhile, and Amazon heavily favors products with positively-reviewed comments from buyers. And the cyclical process goes around: more reviews means that Amazon will be more likely to show your product (assuming that they are decent reviews), and the more people that see your product, the more likely you are to get purchased and reviewed. 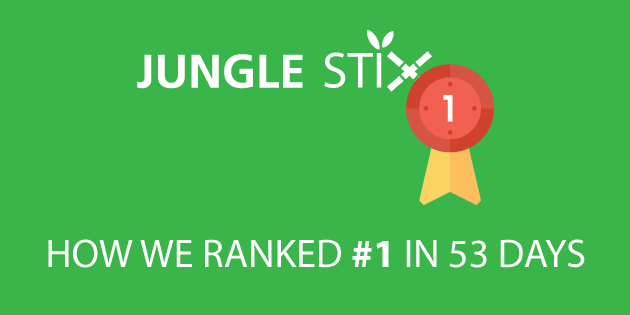 All this is to say that the reviews, and the social proof that accompanies the reviews, have helped tremendously in pushing Jungle Stix to the top position so quickly. One of the great thing about Jump Send as a seller is that I am able to regulate how many units I give away, and I can approve everyone who I give a promotional product to. Running a giveaway can be pricey as you can imagine with the cost spent for each product, however, it is one of the most important parts of the launch process that I focus on at the start of every product that I launch. As you can see, the top 5 organic results were selling more than 7000 units per month combined (average of 1500 each), and almost $150k in revenue combined. Not too shabby, especially considering that the 3rd ranked product by Perfect Stix had only 16 reviews. I knew I could get my product up ranked up there just on reviews alone, so I knew that the competition was very manageable, especially considering how much sales were up for grabs! Sufficient demand and consistent sales: Looking at the data collected in the Product Tracker, it appears that the promising figures we saw last week look realistic and consistent—there is no artificially inflated numbers. The rank seems to stay between 400 and 1500, and several sellers are hitting 20 to 30 sales per day. Abundant Depth: Even past the top five listings, and those sellers without a bunch of ratings, sellers are moving product. Who knew marshmallow sticks had such demand? 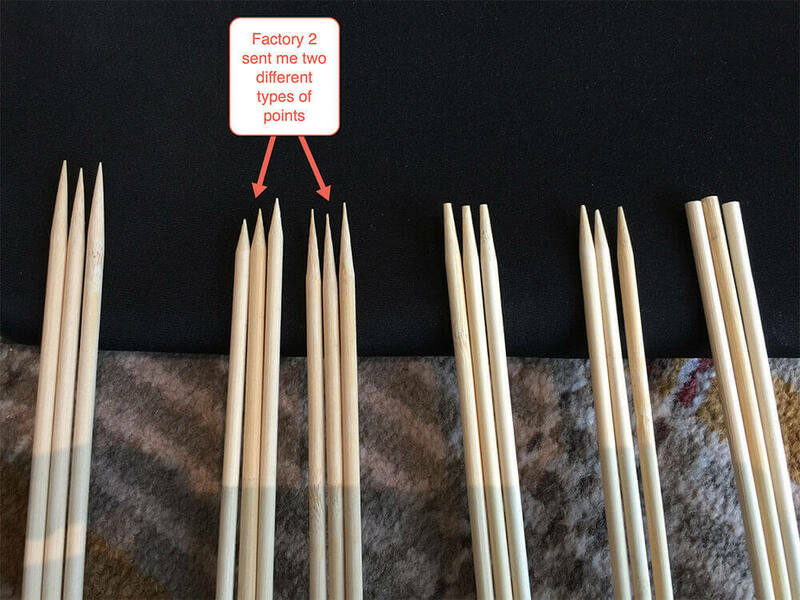 Product Variations: There are a few types of marshmallow sticks (bamboo and metal, with prongs or not, rubber handles, etc). We can therefore differentiate and improve our product from the existing offerings in the market. So I basically saw that there was a lot of demand, the demand wasn’t concentrated in one big player in the niche, and that there were ways that I could improve on the existing product offerings. Ultimately, my improvements were offering a better value (110 units per package, instead of the 100 that many offered), and offering the longest sticks possible, which is 36″ sticks. In addition to having products with reviews that I could compete with quickly, I knew that if I laid the groundwork the long-term, the benefits would multiply. Specifically, I knew that I could create a better listing very easily, and reap the dividends for a while. There is only one product photo (and the actual product is only taking up half of the photo! ), there is not a keyword dense Product Title, and not much in the Product Detail section. We have added as many relevant and targeted keywords as possible in our Product Title, added 7 high resolution photos and graphics to convey the quality, uses, and sizing to customers, and highlighted the main value propositions in the Product Description and bullet points. There could be some further improvements (maybe adding images to the Product Description, adding more text, enhancing the Customer Questions & Answers, etc), but we have done a solid job with the basic listing optimizations. 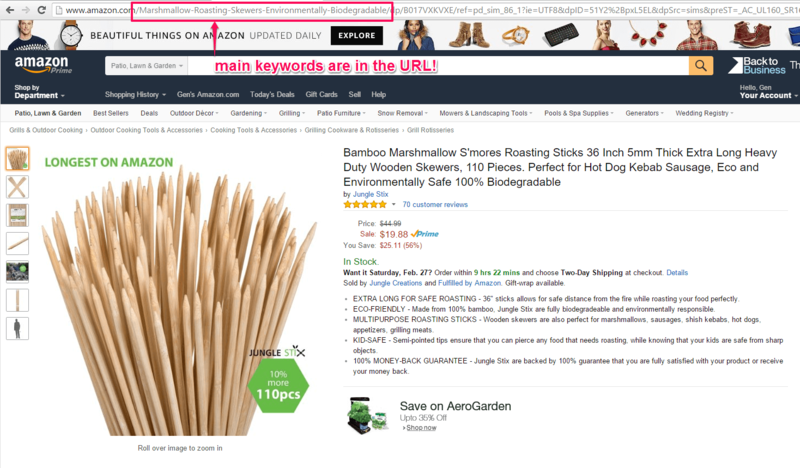 In the image of the product listing above, you can also see that we have some great keywords embedded in the URL for Jungle Stix, “Marshmallow-Roasting-Skewers-Environmentally-Biodegradable”. Amazon automatically populated the URL with those words, but with Scott Voelker’s recommendation, we added those keywords to the Product Title and saved it for a few days, apparently Amazon can sometimes make it a permanent part of the URL, which increases relevancy and likelihood of matching to those keywords. You can read more about that in this session with him here. One note as well when creating the listing, is that we did not include our brand name, Jungle Stix, in the product title. Presumably nobody has heard of Jungle Stix, so won’t be searching for our product by name. Assuming that Amazon puts greater emphasis and value on the first words in a product title, we would be doing ourselves a disservice by including a brand name that no one knows. I firmly believe that a PPC Automatic campaigns should be included in every private label product launch. Here’s why: you are beginning with a cold start, where you have no sales, no reviews, no one even knows you exist. And you don’t truly know the market yet, as far as what keywords customers are searching for, which keywords convert, and how much an ad campaign would actually cost you. So even if it’s just a $10/day budget, let it run for a week and at most it would be $70 spent. That’s the downside. However, there is a good chance that it generates a few sales, and can generate some real keyword data, as far as what people are searching for, and which keywords work for getting clicks and possibly sales. This is where your first Automatic campaign is an invaluable investment, because you can’t get the actual data like that from any keyword research service. Yes, I am an Amazon data nerd and love collecting any data, but I won’t just pay for data for nothing! As you can see, we budgeted for $100 per day, but in reality only usually spend less than $10/day because there just isn’t enough traffic to our keywords to spend our budget. 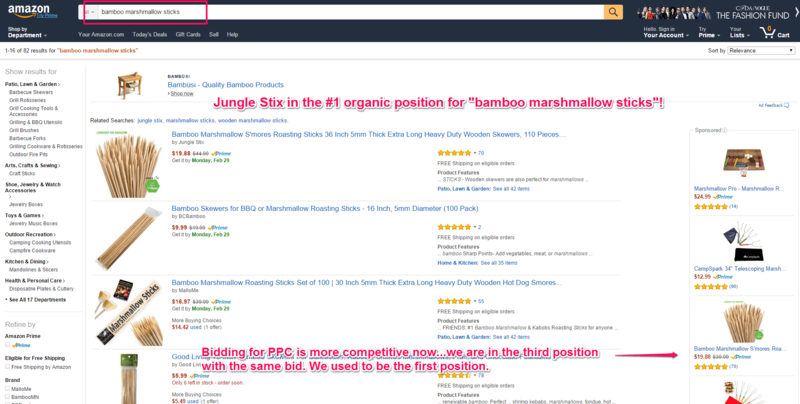 I covered Amazon PPC campaigns, and Jungle Stix campaigns, in depth here, where you can get some tips on improving your campaigns and strategy. Photos are a key component to having a fully optimized listing, but I think it is so important that it merits its own section. I totally understand that launching a private label product can be capital-intensive and requires cost-savings at various junctures. Skimping on product photographs is not where you want to cut corners. It would be like training for a competitive bike race for months, only to use a beat up clunker come race day. You would be setting yourself up for failure. Our photos were done by Robert House at Product Photography, and I think they did a great job, you can judge for yourself. It costs about $45 per photo, and gets cheaper as you order more photos. Alternatively, you can search on Google for photographers who specialize in Amazon product photos, or Upwork or Craigslist often has good quality. I like using Craigslist because it usually means that I can save a few days on the shipping the product to the photographer, and it is nice to build a relationship with a local photographer. Pixels of at least 1000 to ensure you get the zoom effect if a user overs over your image. I feel like you can almost smell the bamboo and feel the semi-sharp tips with this zoom effect! Include as much of the actual product as you can in the main image. When your listing appears amongst a crowd of competitors and Amazon’s clickbait screaming for your eye, you better stand out fast! In addition to making your product as large as possible, you can create an interesting composition (we tried to make Jungle Stix come alive by being splayed out in a bunch like that), remove any reflections or shadows in the image, and any distracting extraneous elements. Amazon has two main goals every time you go on the site: 1. Buy something (preferably a lot) 2. Be happy with your purchase (and tell others). You will very rarely see a poorly reviewed product for a generic keyword search, as it is not in Amazon’s best interest to offer you a shoddy product and have an unhappy customer. So the 5 stars that we currently have for Jungle Stix is critical to having our top placement. There are two steps that I think are invaluable in launching a quality product that will generate a majority of great reviews. Get Your Samples: I credit a thorough process vetting samples and suppliers as one key step that can not be skipped. Again, this is something that is an upfront expense that increases the startup costs, but think of it as an “investment”. Launching a private label brand can be a highly profitable, scalable, and sustainable business….IF you set up your business with the proper foundation. And it all begins with a quality product, and comparing the product itself, the communication, and the responsiveness of your supplier. This is a better view of the tips of the sticks. I wouldn’t really want kids using some of these sticks! There was a noticeable difference in the quality and feel of the bamboo which I would not have been perceptible simply by looking at the photographs. Check Your Product AFTER Production: So once you have chosen your supplier and find that they can make the product with your exact specifications, you are not done yet. I always receive the first shipment of production and spot-check it for quality assurance. Once I can confirm that it meets the standards agreed upon with the supplier, I ship it to Amazon warehouses. Alternatively, you can hire a Quality Control or Inspection service to visit your supplier before you have spent time and money transporting it to your door step. The benefit of this is that if there is actually a problem, you can identify it more quickly and have your supplier actually do something about it. The downside is that you are again relying on a third-party observation for qualitative and quantitative assessments that may have different standards than me. I think that hiring an third party inspection service makes a lot of sense for a more complicated product that can have issues in manufacturing, say electronics or a fashion-related product. 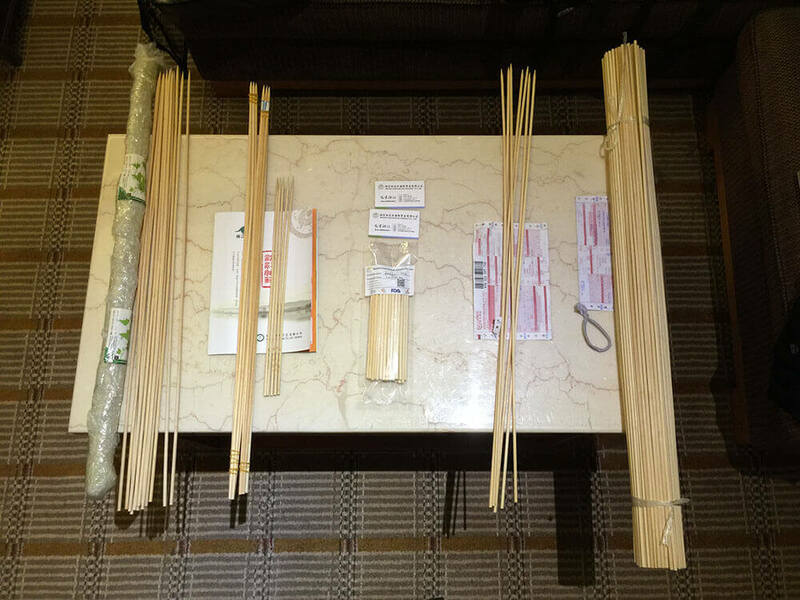 Bamboo sticks are not that complicated, so I did not get an overseas service to inspect these before they were shipped to me. Selling a private label product can be competitive, as there may be low barrier to entry, high upside, and abundant opportunity. I started noticing a few new competitors in December, selling a very similar product and targeting the same keywords. This didn’t phase me, as it was only a matter of time before other people would jump at the opportunity. Amazon is a huge pie, and there is more than enough to go around. I just needed to focus on my two main priorities: getting sales, and getting reviews. Getting reviews was taking care of itself, with my product listed on Review Kick. As far as sales, my new competitors were pricing at $19.99, whereas I was priced at $27.99. I did not want to lose momentum with my sales and be undercut on price, so I also priced my product at at competitive $19.99. A quick note on pricing: I do not like to compete on price. Period. It is a poor business strategy that is akin to sprinting to the edge of a cliff, with a good chance that I overrun and…..watch profits and the business go splat. However, with Amazon and Jungle Stix in particular, I knew from looking at Google Trends that Jan-March are the low season for marshmallow sticks, and I wanted to position myself to reap the benefits of a surge in a demand that I expect as the weather gets nicer. While the profit margin is far less when priced at $19.99, I am not losing money, and I am getting more organic sales and seeing the benefit in my Best Seller Rank improving as well. So did my game plan work? 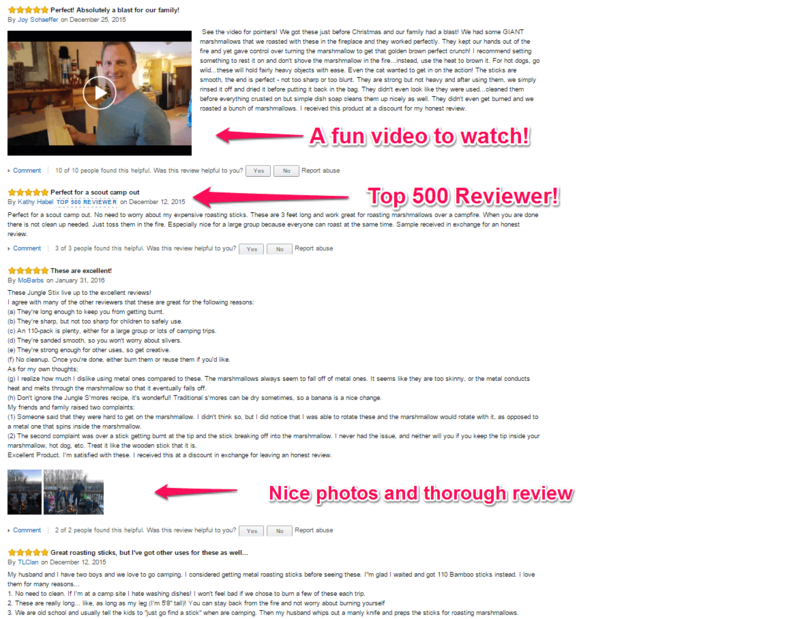 More reviews, more organic sales, a better BSR and ultimately the top position…..as of now, it is working. Amazon also considers past seller history in its algorithm, so generating more sales, regardless of price or profit, is further cementing my position in the top spot. We shall see though…. 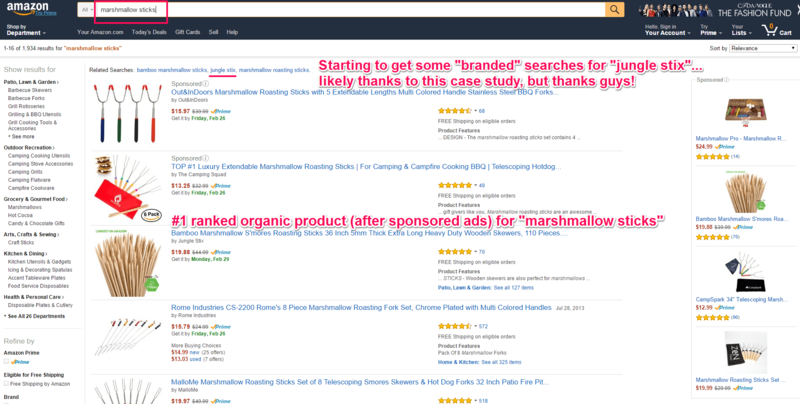 The last key factor that allowed me to get the #1 Spot in the Amazon organic results is inventory management. This was a bit trickier with Jungle Stix, which were limited to 500 units at one time due to being oversize, so I had to consider the required time related to production, transport (both from overseas and within the US to Amazon warehouses), and the storage limit. If I were to run out of inventory and wait a few weeks for sticks to be produced or delivered to Amazon, it wouldn’t matter what position I had achieved, because Amazon would suppress my listing. No one would see it. And guess what? I actually did run out of inventory for a few days. So I suppose the Inventory Management wasn’t perfect for Jungle Stix (though in reality the issue was with customs and the importing process). Fortunately, I was only out of inventory for a few days, and I recovered quickly. However the point remains: managing your inventory levels and always being aware of how much time until you are out of stock is imperative to keeping your top spot. There you have it, 8 steps that helped me achieve the #1 ranking in 53 days. As you can see, there is not really any magic sauce behind it, except one: execution. These are all very manageable tasks, and if done properly, can be achieved on a repeatable basis. I’m sure you can hear my own voice in your head, but I will repeat it: it all begins with doing thorough product research. Know how much demand you can expect, how much competition, and how you can differentiate to improve upon existing products on the market. 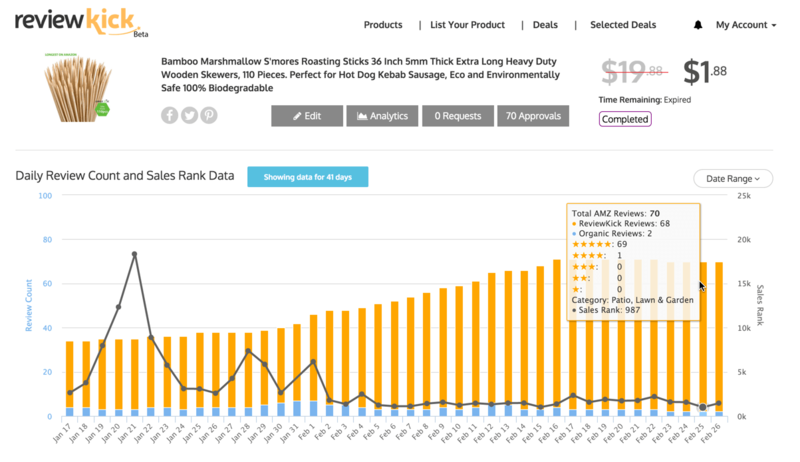 And even if you don’t have Jungle Scout to help you generate product ideas and the other key metrics to determine a ripe opportunity, you can use our free Sales Estimator to find out the estimated sales for any BSR in any category. I hope that this guide has helped you! Do you have any other tips that I may have missed? If so, drop them in the comments below, would love to hear from you and rap on how we can all improve our launch process! Hi Rosalyn, you can enter your email on the blog homepage here: https://www.junglescout.com/blog/ and click “Stay up to date” to get notification when new posts go up. Amazing work! Thanks for collecting these Amazon keyword software, the largest selection ever! rank and not the categories? Not sure how this applies to Amazon selling. Do you mean an Amazon product or a blog? I want to rank best forged irons on Amazon first page. I am a seo expert but struggling to rank a low competitive kw on Amazon. Kindly what should be the right approach. Excellent! I was looking for this. Your article help me a lot to create an great listing. Is it possible to achieve a first page ranking without having a private label product? What’s the best alternative to Google Keyword Planning tool you can recommend? Google Keyword Planner is the best free tool, but it’s more useful if you are running Google AdWords campaigns because then it gives you more accurate monthly search volumes. What serves as a replacement for review kick to get honest reviews as review kick cannot do discount for review? Also, how is accounting for different states sales tax handled with Amazon? I’m looking at something to do part time as I build my commission only business. Hi Brandon, you can use Jump Send http://www.jumpsend.com to send automated follow ups and then reviews. Great sharing bro, now days its very difficult to rank amazon niche websites. Many algorithms are changing day by day. Will reviewkick service available for UK amazon seller? Unfortunately at the moment Review Kick does not support UK, but we are working to build that functionality very soon! Hi there, great work. really appreciate. One thing that Greg didn’t touch yet (and I know it’s not fun to talk about this) is the amazon sales tax for the states in US. this is really scary, We live in Canada, and dont want to get in trouble with tax guys and want to be fair with the state laws too. So, if he can do one blog on this it would be great. I know there are resources around, but it would be great to see it from sellers perspective. The New Niche Hunter is Awesome. But just about the time I think I have it all figured out somebody throughs me a curve. My first PL I stumbled into accidentally and it’s doing great. I sell 20 to 30 units a day. But since then I think I might be over analyzing things. And with the new Niche Hunter it’s getting worse (SO PLEASE CREATE US A VIDEO WHEN YOU CAN). Here is an example of what I mean. I found a product using the Product Database, Checked it out with my JC Pro, added it to my Tracker. I though it was a good one but then came Niche Hunter and the product doesn’t even show up. Instead the same item shows up but with only 10 to a pk instead of the 32. And everything now says don’t buy. Greg, here is hoping you can create a video for those of us who are slow to catch on. We will get a video up shortly as well! Very detail review and sharing. Thanks for it. Reviews are definitely one of the key success in Amazon, and recently seems that Amazon algorithm changed a bit that reviewers from discounted price purchase are value less than before? Especially to get “Verified Purchase” reviewers. Hey JJ, thanks for the comment. Have you seen this change retroactively for reviews that you have already received, or just for more recent reviews? One thing that helps if you use Review Kick to get promotions is that reviewers are required to mention that they received the product at a discount in exchange for an honest review. A great resource for all of us. Thanks for putting it together Greg. Is Review Kick yours as well? one thing i dont understand in general, what makes u come up at the top of amazon? Can you tell me if JungleScout will work with European Amazon sites, UK, Germany, Spain, Italy and France. The Jungle Scout Extensions currently support Amazon US and UK stores. The Jungle Scout Web App currently works for only Amazon US. 1. How did you get the photoshop picture to be non zoomable? 2. Do you have any concern that the photos & html violate Amz TOS? I have watched this series with great interest. There were some gems which came out in the video on adding the product in Seller Central. Info that no one else seems to be telling us (no commas in keyword lists, etc.). I believe you said that ReviewKick only works in the US? When can we expect it to be available in the UK? Hi Greg — great info, as always. Question — did you need to get a Timber and Timber Products Import Permit (PPQ form 585) before importing the Jungle Stix? I’m a newbie, but I thought my research idcated it was a requirement, even for bamboo products. If so, can you let us know how much it cost and how long it took? Also, since this is a product that comes in contact with food, did you need to get a permit for importing food contavt materials? Where/how? I’ve bee trying to find information about that one with no luck so far. Thanks! Thanks greg, concise and really helpful. Hi Greg, Great stuff. Thank you so much for sharing. I like your style of training and we love your Amazon tools. Have a great day! Great information. My question is this: what was the differentiation you made for your product, how did you decide what that differentiation would be and how did you convey this to the manufacturer? Jungle Stix are differentiated from existing products because there are 110 per package (whereas other options on the market have 100), so there is a better perceived value for customers. Also, the sticks are 36″ long, while most competitive offerings are 30″ or 24″, so they are positioned to be safer for kids who can stay a safer distance from the fire. hope that helps! I have a question about the images in the listing. You haven’t had any issues with including text and logos in the main photo? Thank you for your great insights with very helpful details. THANK YOU and keep up the good work. Which software is that “improvement in unit sales” screenshot ? That screenshot of the “improvement in unit sales” looks to be from Amazon’s Seller Central dashboard. I followed your guidelines and launched my first product on Amazon, its been more than a month, I had sales during fist month and now no sales alt all for last 2 weeks. I have good pictures, good reviews, currently my product has 4.5 stars on amazon, I am running both manual and automatic campaigns. I want to understand if I am missing anything or do anything to improve my sales. Below is the link for my product on amazon. I would assume it has something to do with the last movie of Star Wars now fading on the scene; it is not such a hot topic as time advances. Maybe change the design of the mug to a more general one…? I hope you get back your sales in no time and keep pushing forward. While your images are good quality, there are none showing people. Here’s what I would do: look for photos of kids dressed up in Star Wars outfits. A mini Darth Vader, a Princess Leia, a little Wookie, etc etc. Paste an image of the mug alongside the kids, even if the mug is the same size as the kid. It doesn’t matter, as long as it’s not the main page, of course. People will then associate the mug with “kids having fun”, and understand what you’re trying to convey. Even though the photos don’t show the kids USING the mugs, it will get WAY more attention. People LOVE pictures of other people. They don’t need to see pictures of a mug repeated over and over. That’s boring. Bet you that will help!!! Um, don’t you have to license Star Wars images?